Sitka Valerian found me. I wasn't looking for her. I was looking for a camping spot with my family on 4th of July weekend. We were miles off Blewett Pass, looking for a campsite near the headwaters of Naneum Creek. We passed a wonderful site we stayed at a few years ago, but the site was occupied. We passed others that just didn't seem like the place we wanted to stay and kept going. Late in the afternoon we found the perfect spot with enough room to pitch our tent, protection from the wind, a meadow through which a trickle of Naneum Creek ran, and an established fire ring. After we completed the busy task of unpacking our belongings and setting up camp for the weekend I sat down, looked around and marveled that we had this wonderful location all to ourselves. 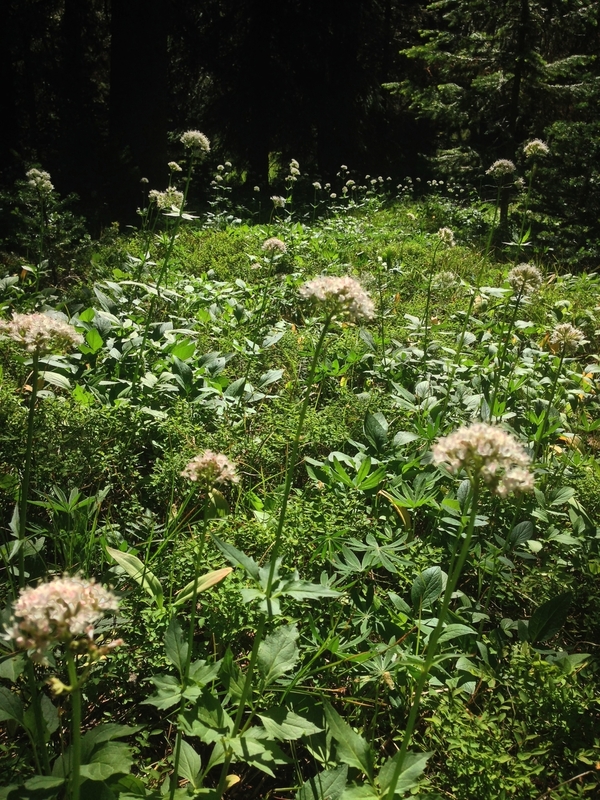 It was then that I realized I was surrounded by Sitka Valerian. Valerian root has been one of my most used remedies since my sister first introduced me to her years ago. Valerian root is a wonderfully relaxing herb. I believe she is among the best sleep promoting herbs. Valerian is sedative and anti-spasmatic. I have found Valerian most beneficial during those long nights where you wake repeatedly and cannot find sleep. Valerian always helps me drift back to the land of dreams. The Valerian root you will find in most commercial preparations is that of garden Valerian Valeriana officinalis. Sitka Valerian Valeriana stichensis grows at high elevations in moist subalpine meadows from Alaska to Northern California. Inherent in this tough little flower is the fortitude and hardiness required to live in a mountain environment. For this reason, some herbalists believe that the medicinal properties in Sitka Valerian are stronger than that in the garden variety of Valerian (V. officials). I harvested a handful of Sitka Valerian roots that weekend, to make just enough tincture for myself. I plan to return this late summer or early fall on a new moon when she is transferring her energies to her roots, to collect just enough to make a wonder sleep remedy for the apothecary.